No word what the possible prizes might be, but those bold enough to wear a costume to Thursday night’s Southern Tier tap takeover at Wildwood Barbeque are in the running. And there’s a great lineup of beers to sample in any case, including Warlock. 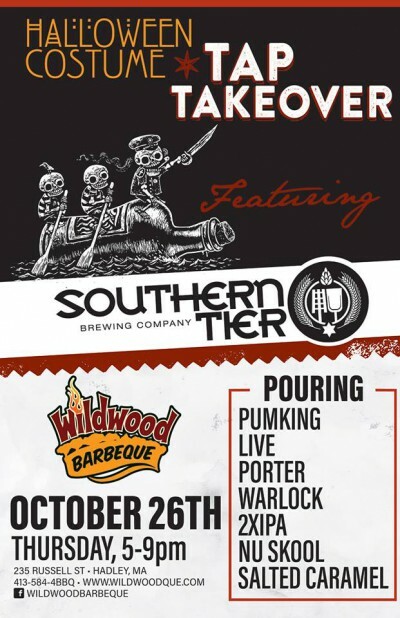 Southern Tier last commandeered the taps at Wildwood back in 2014, an event I missed, so I’m looking forward to trying a few beers I’ve haven’t had from the Lakewood, New York brewery, including Live (a Citra-hopped Pale Ale), Nu Skool IPA, and the Salted Caramel Imperial Stout from the Blackwater Series. Filling out the dance card is Pumking, Porter and 2XIPA. 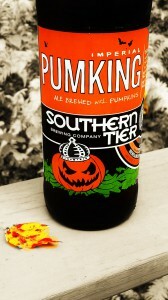 Southern Tier makes so many different beers in various categories that seven is barely a fifth of the roster. (I counted 33 in their 2017 release schedule, seven of them year-round.) 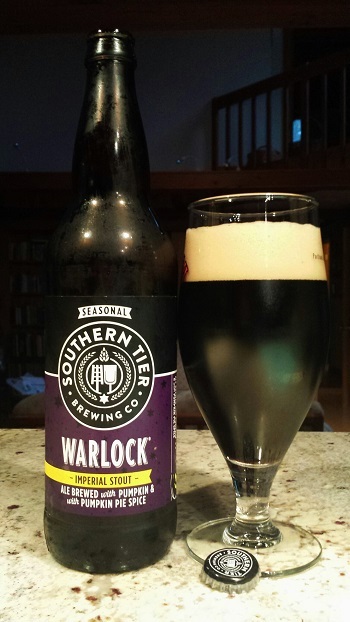 Warlock used to be classified as a Blackwater beer (there are five of them, all flavored Imperial Stouts), but Southern Tier recently did some rebranding, and it now shows up as part of the Imperial Series (there are nine of these, including the semi-notorious Pumking). What’s in a name? The Warlock is still a thrill ride of an Imperial Stout, brewed with pumpkin and pumpkin pie spices like Pumking, its lighter-colored sibling. Both beers are so brimming with sweetness and pumpkin pie character that they could easily occupy their own category of beers, ones that are probably appreciated as much for their novelty as their flavor. Or not appreciated at all, since there are plenty of tasting notes out there in cyberland from beer fans who can’t stand either one. Both beers have more fans on the appreciative side than the nauseated. I’m sort of a middle-of-the-roader. I’ve always found Pumking more amusing than desirable. It’s so over the top sweet, virtually reeking of vanilla and tasting like pie with whipped cream, that one bomber bottle every year (or so) is quite enough for me. I actually prefer the Warlock, which is pretty similar all in all, but is dark as Halloween night and has the faintest hint of roast going for it. But be advised this is an imperial stout far more in name than in flavor. The pumpkin spices absolutely rule here. Last year’s version actually clocked in at 10% ABV, so perhaps it had a more warming effect as well. But both brews have seemingly settled at 8.6% ABV this year, still a snootful, though there’s little evidence of alcohol on the way down. I reviewed Pumking back in 2014. 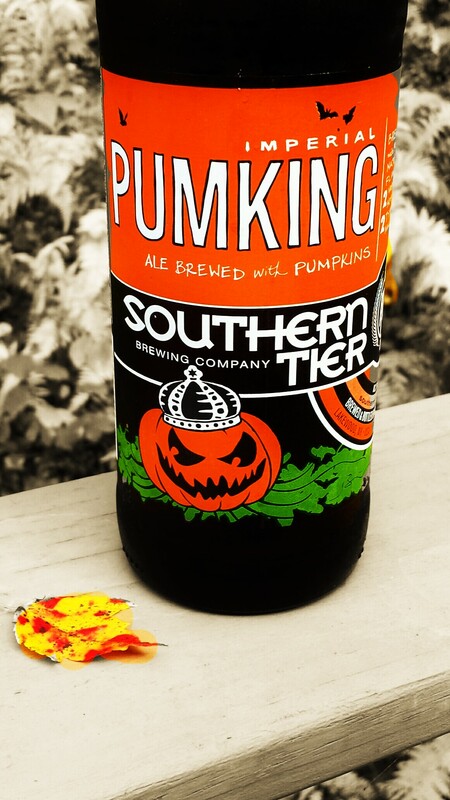 Since that time Southern Tier has expanded its distribution to 38 states, opened a tasting room in Pittsburgh, and went into partnership with Victory Brewing of Pennsylvania under the Artisanal Brewing Ventures umbrella. (A play on ABV?) One of the fruits of the partnership is a new joint production brewery and tasting room to open up in Charlotte, North Carolina sometime in mid-2018. In that 2014 review I noted reports of some drinkers who like to blend Pumking with Warlock, calling the concoction Warking. I suggested if there were no Warlock on hand a blend of the Pumking and Porter—Porking—would be appropriate for a barbecue joint. I just might try it. Availability: From August until it runs out, more than 38 states nationwide.